Can you believe it? Simply At Home Mom just turned three years old! It’s true that time flies when you’re having fun, and these last three years have been just that. I started this blog with the desire to share bits and pieces of my busy life with all of you, because I knew so many parents could relate to the hectic and sometimes chaotic profession we know as motherhood. I’ve learned a lot along the way and hope that you have too. What could I do to give back and say thank you?? Everyone can use a little cash, right? What better way than to host a $30 Paypal giveaway…..$10 for every year so far. By the way, every year the birthday giveaway will just get bigger so….I want to say THANK YOU to my readers for the last wonderful three years and here’s to many more! 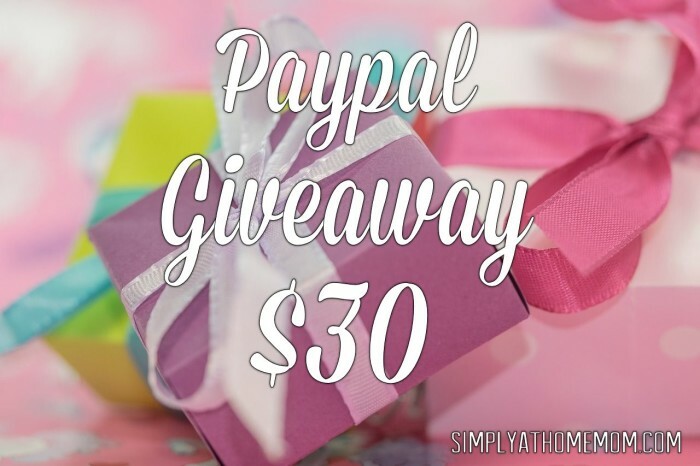 Enter to win $30 Paypal from Simply At Home Mom! Must be 18+ USA only. Winner will be randomly chosen within 48 hours of giveaway end and will be notified via email. All participating blogs are not responsible for prize fulfillment.